Enterprise virtualization prediction for 2018, tl:dr - no drastic changes from 2017. There are some interesting possibilities, though, and I've used Simon Wardley mapping to diagram them. 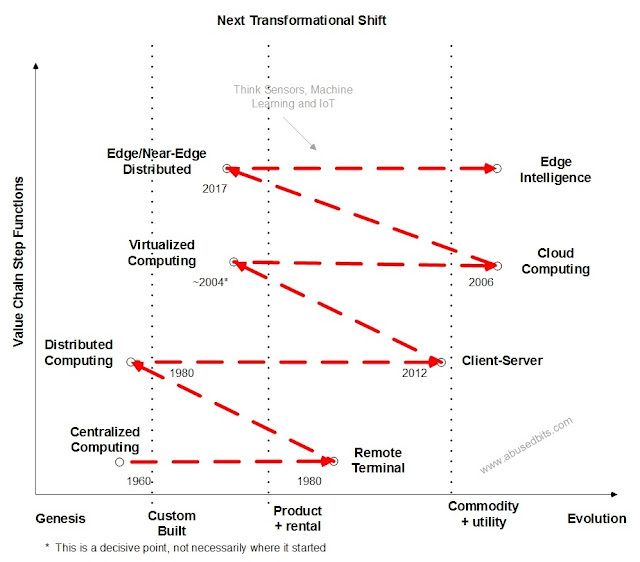 As shown in the map on the left, we can now argue that the consumption of virtual machines has trended all the way into commodity consumption (with standardized tooling, automation and operating environment). If it hasn't in your company, you may want to start asking why. One of the more interesting possibilities for 2018, if the equipment vendors do this correctly, is composable infrastructure. This could completely displace traditional compute and push it into commodity consumption. I'm going to leave it as a dotted line in the figure for now, as the business impact of technical accounting for corporations might make this a non-starter. That said, I have to imagine that a true utility in any premises would be good for the industry and the consumers. In the public cloud map on the right, we may need to incorporate some changes based on enterprise use of public cloud to include the difference between “cloud native” capability vs enterprise hosting requirements. Cloud native capability is the service consumption of the public cloud that relies only on the tools and capabilities built into the public cloud platform element. Using it for new application development, including things like serverless application design, is growing as AWS and Azure partners and consumers learn to take advantage of those cloud native features. Cloud Native platforms are not particularly well placed for traditional enterprise workloads, though, which often require more specific (as well as traditional) care and feeding. Furthermore, refactoring enterprise applications to take advantage of Cloud Native features may not be a worthwhile endeavor considering the cost to do transformation of applications. The general thought is to give them a safe place to run until they are no longer needed. The enterprise hosting data center exodus from 2017 provides some of the highlights of why workloads will move out of the data center. It may not be obvious, but the unifying element of both of the diagrams is how Hybrid Computing will be handled between enterprise virtualization and public cloud. This integration still looks very much like early product (see diagram above). And if you want to know more about my Wardley mapping mis-adventures, follow this link.